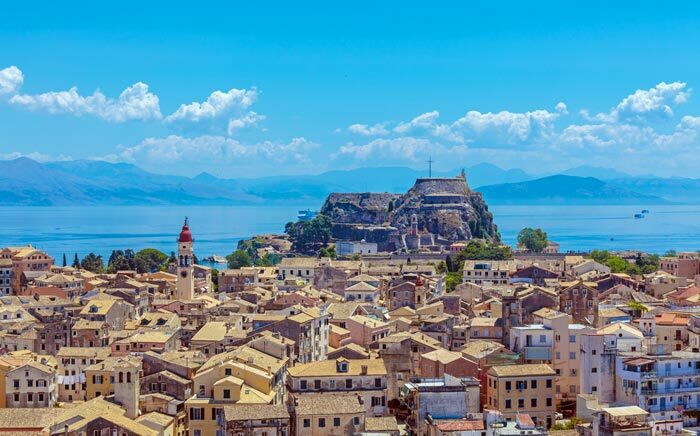 While Corfu is very much a Greek island, it’s easy to see the historical influences from the Venetians and British as you look around Corfu Town. Elsewhere the typical whitewashed Greek homes dot the rugged hillsides, while Corfu’s interior is lush and green with relatively untouched villages to explore. 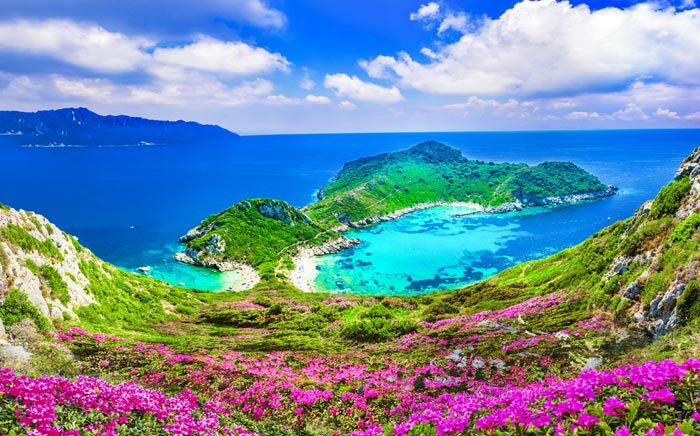 Great beaches and weather make this the ideal summer vacation destination, yet sophisticated architecture, museums, and ancient sites add so much more to this popular Greek island. If you’re looking for inspiration for your next vacation, our top 10 things to do in Corfu will have you booking your flights in no time! 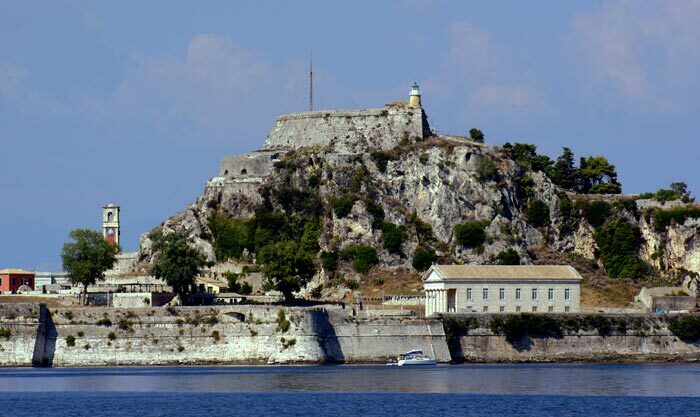 Sometimes better known as the Old Fortress of Corfu, this 14th century Venetian-built fortress occupies a promontory that was once the entire old town of Corfu. Today you can explore parts of the site, many of which were added in later years. Be sure to climb to the highest point where there is also a lighthouse as the views from here are great. The small Church of St George is also a highlight, and, if you wander down to the sea there are quiet gravelly beaches. 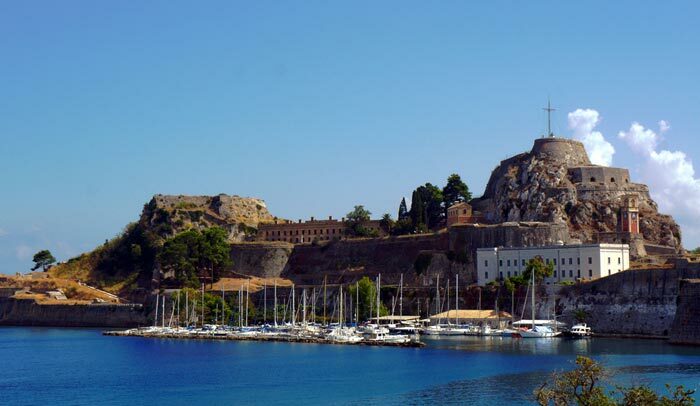 This Corfu attraction also includes a small museum with exhibits on the Byzantine era. 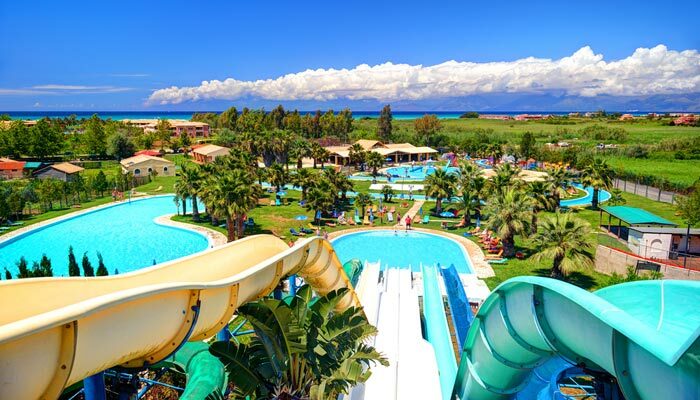 Take a break from the culture, history, and beaches and spend a day in a waterpark instead! Aqualand is a fun, family-friendly waterpark that has a great selection of water slides, as well as other water-based activities. Add it to your list of what to do in Corfu because there are things for all ages here, whether you’re into the scary, adrenaline-rush slides, or something far more sedentary, there are 36 slides in total and 15 different adventure pools including a wave pool, a lazy river, and themed areas for the younger kids. The park also has places to eat and drink, and sunbeds and parasols are available free of charge. 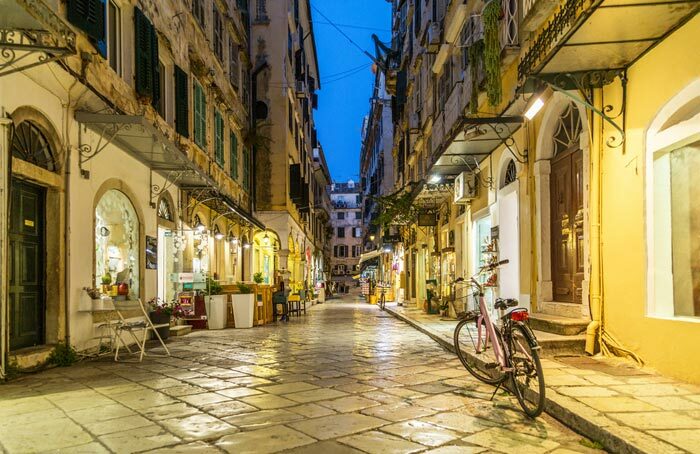 Several of the attractions on our list of top things to do in Corfu can be found within Corfu Old Town, but even if those don’t attract you, a visit to the Old Town is still highly recommended just to walk around and soak in the atmosphere. It’s a pleasant place to spend an afternoon, where you can shop in the various stores, wander through the narrow streets, then enjoy a tasty meal in one of the many restaurants, cafes or tavernas. Built as the summer palace of Austria’s empress Elizabeth during the 1890s, this beautifully preserved palace is now open to the public. 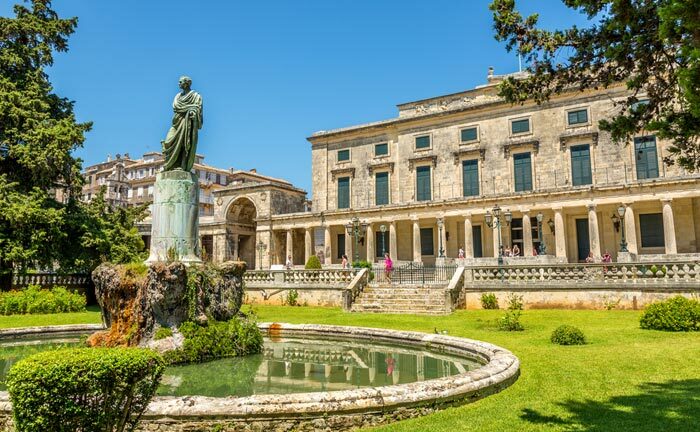 Although inside may fall short of some visitor’s expectations, there are many works of art to see and statuary, however, it’s the exterior architecture, gorgeous garden terraces and stunning views that are by far the highlight of this Corfu attraction. 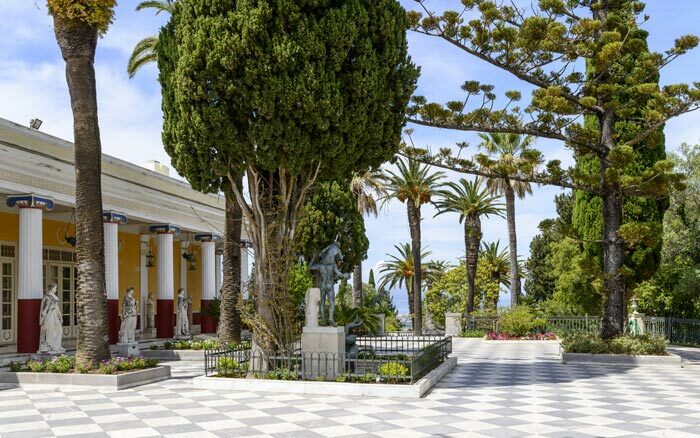 Come and enjoy the views of the island from the palace’s elevated position on a coastal hill, about 12 kilometers (7.5 miles) outside Corfu Town. 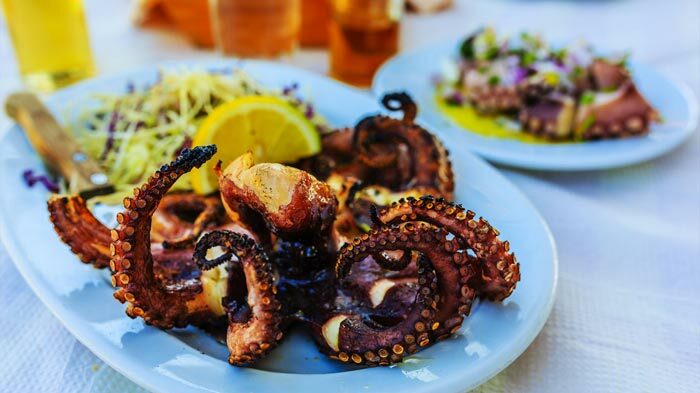 Like Greece’s other islands, you’ll find a great selection of cuisines on Corfu from the typical Greek dishes, to British fish and chips, and a wide variety in between. 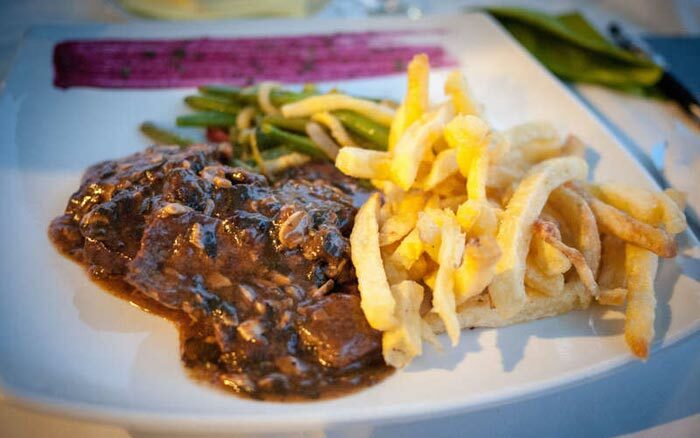 Be sure to try some dishes that are more authentic to Corfu though, as these actually have a lot of influences from Italian cuisine thanks to the Venetians controlling the island for a long time. Some dishes you may like to try include Bourdeto, from the Venetian word ‘brodeta’ meaning broth – it’s a fish broth dish. Then there’s the more Greek-style dishes like Tsigareli made with cabbage, tomato, spicy peppers, potatoes and herbs, and Pastitsada, traditionally eaten on a Sunday. Corfu’s coastline is full of beautiful, clean beaches, so if you enjoy days relaxing on the beach and swimming in the sea, this is a great island to visit. Choosing a couple of beaches from so many good ones is no easy task, but Gardenos Beach makes our top 10 list of things to do in Corfu because it is long, features nice sand, and shallow waters, making it ideal for families, plus there are activities for adults and older kids too, like water sports, and a few tavernas from which to get your food and drinks. The striking cliffs also provide a very scenic backdrop. 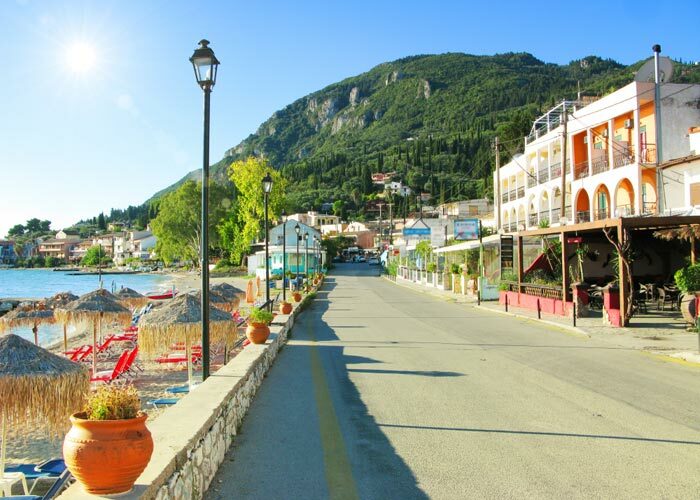 One of the original resorts of Corfu, and for that matter, Greece, Benitses has developed over the past few decades yet it retains much of its original traditional fishing village charm. Whether this is the place you choose to spend most of your time in Corfu, or you’re just visiting for a day, Benitses has plenty to see and do including gorgeous blue flag beaches, wonderful restaurants and tavernas, and a good number of bars if you’re here for the evening. 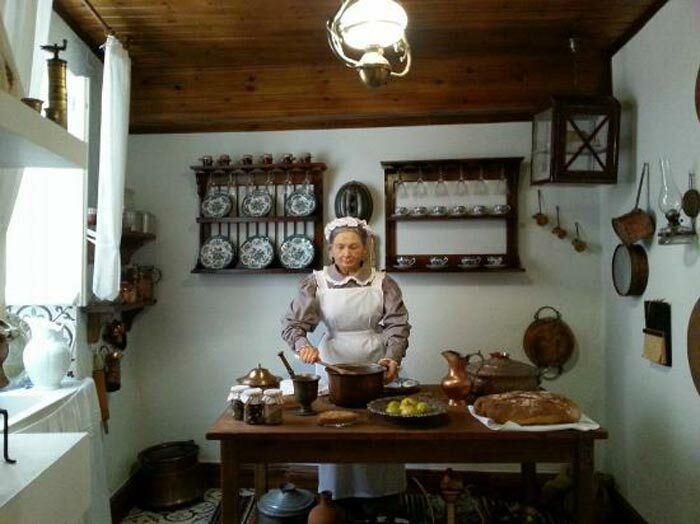 Be sure to visit the original village, and the Corfu Shell Museum is interesting too. 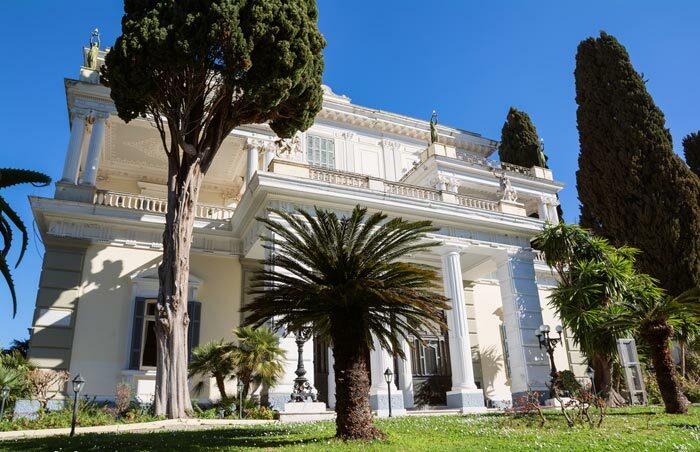 Corfu is rich in culture and one of the best places to experience this is the Corfu Museum of Asian Art. 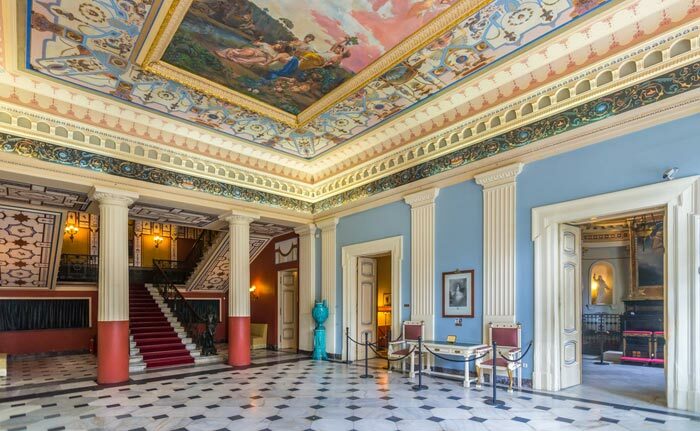 Always highly rated on list of what to do in Corfu, this museum is situated within the Palace of St Michael and St George, in Corfu Town. It’s he only museum in Greece to be dedicated to Asian art and it does this spectacularly well. The entire collection is some 11,000 objects with the oldest being from the 11th century BC. See art from Japan, China, India and more, plus the chance to view the Throne Room of the palace in all its glory. You can see British, French, and Venetian influences in many different places in Corfu Town, but perhaps one of the best is Casa Parlante. 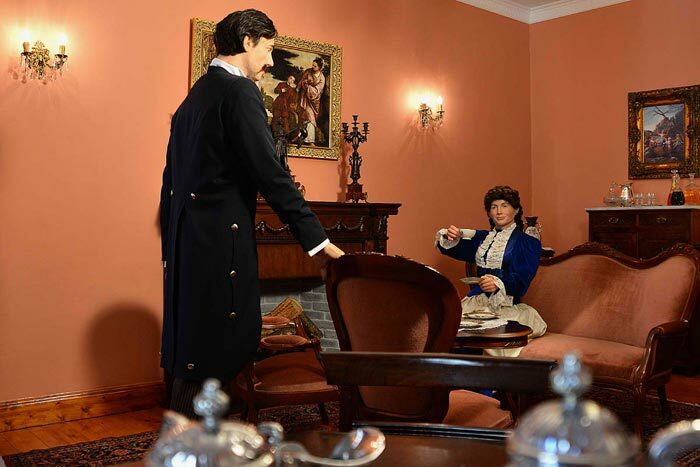 This noble mansion dates from the 19th century, and important time in the island’s history, and it’s all brought to life via animatronic figures and authentic reproduced decor and furnishings. 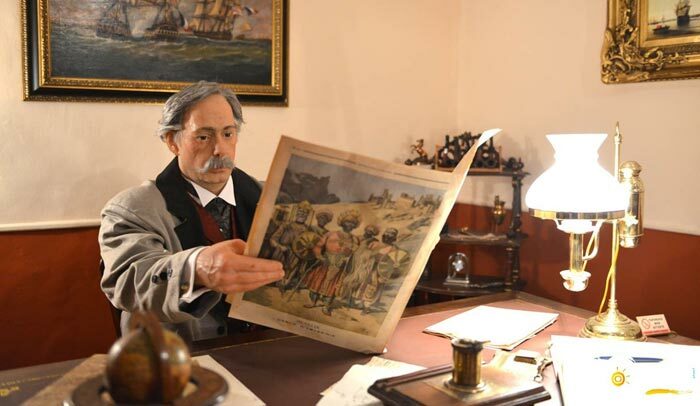 The house provides a wonderful insight into this period of the island’s history and is always very highly rated on lists of things to do in Corfu. 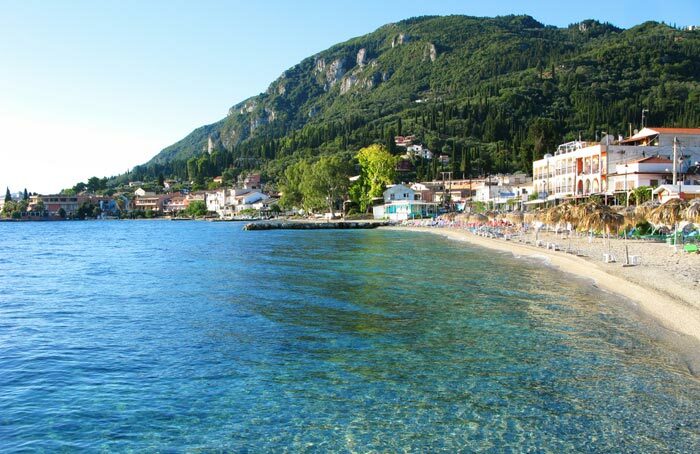 Our top Corfu attraction is Porto Timoni Beach. This hidden gem is becoming better known among visiting tourists but for now, it’s still a quiet place that’s not especially easy to get to. 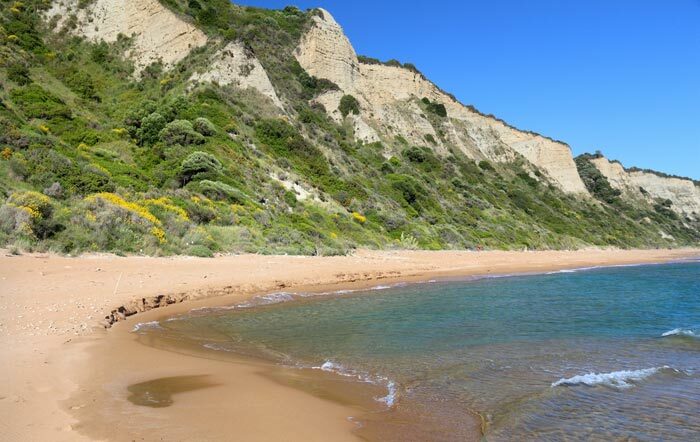 The two small beaches sit on either side of a narrow strip of land surrounded by lush green cliffs and hillsides that make this one of the most beautiful beaches in Europe. The protected bays provide gentle waters, great for swimming and snorkeling, and because it takes about 20 minutes to walk here, it’s nearly always quiet. Bring your own food and drinks, as there are no facilities.